Judging by the Cover – 9/19/18 new releases – AiPT! Forrest and Eric share their favorite comics from the week’s new comic book releases. This cover is largely dissimilar from the rest of the covers in the series it’s following and I also think it’s the best. I’ve seen very few things depict eldritch horror in this way – so colorful and brilliant. It’s almost more unsettling than something like Bloodborne might be, as if we’re seeing things we’re not meant to illuminated in the nanosecond of a lightning strike. The award for most metal cover of the week (or at least of my picks) goes to this Thor cover from Esad Ribic, who has already proven himself a master of this kind of effective simplicity. Everything here screams potential: the font – heavy and metal, the claw marks in the eponymous hero’s hammer, the fiery power of the phoenix and the beams of cosmic light trailing from its eyes – it’s sublime. I’ll admit that this one is primarily a nostalgia choice but I also think that it’s one that plays smartly into those elements. A lot of people, myself included, have a very specific fondness for the Secret Wars suit and the symbiote-focused nightmares that follow. This cover hits all of those key visuals perfectly. The sharp contrast between the red and blues of the old suit, the stark blackness of the new, and that horrible phantom wail on the background. It’s a great throwback while promising something new, too. 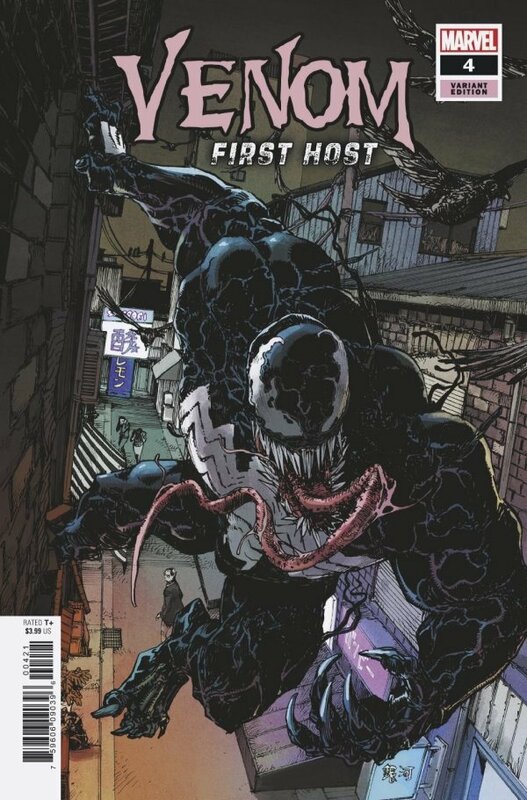 I love everything Takeshi Miyazawa does, and his take on Venom is fantastic. All the twisting lines add a fluid sense of energy befitting the symbiote. The tongue is also menacing, not to mention the teeth. The details on the buildings in the background are also great and help ground the image in reality. Can you imagine being the woman on the street looking over her shoulder and spotting Venom? Talk about terrifying. That storm sure is wild, huh? Another issue of The Wild Storm, another time that it makes my list. I love the view of the storm clouds from way high up, and how they absolutely dwarf the building being crushed beneath them. The lightning and the flying figure also look great, as does the way the grass bristles in the wind. Yet another cover that’s better than Watchmen. This thing is just batshit. Venom with weapons is cool™, and the zany heads of the villain symbiotes are fun. There’s a lot going on here and it works.